Where were you on November 8, 2016, the day that shook the very foundations of politics in the United States? I remember very vividly where I was, and the shock I felt as I watched Donald Trump give his victory speech at the close of the 2016 presidential election, here, in New York City. I was at home, and it was the early morning hours. I was seated on my couch, with my jaw pretty much in my lap. I couldn’t believe what I had seen. For many across the country, including myself, the thought of a Trump victory seemed impossible. His rhetoric throughout his campaign seemed damning from the very start. From calling immigrants from Mexico rapists and criminals and mocking a disabled reporter on the campaign trail, to the disparaging comments made regarding women in the Access Hollywood tape released just one month before his triumph at the polls, the chances that Trump’s campaign could yield any sort of victory seemed miniscule, and polls around the country agreed. News sources such as the Washington Post and the New York Times were quick to paint Hillary Clinton as a massive frontrunner, with the Times indicating that the likelihood of a Clinton victory was as high as 85%. Other more tempered outlooks, while not forecasting a shutout win for the former Secretary of State, saw Clinton as the favorite. There were very few voices in the media that suggested an upset was even possible. And yet, that very night in November of 2016, the country watched Trump rise to power, beating Clinton and shocking the nation. Trump’s shocking upset would only be the first of many surprises he would bring. The past two years of his presidency have led from scandal to scandal, with many of his actions putting him in the spotlight for all the wrong reasons. In his first year in office, Trump issued 55 executive orders, the most since President George W. Bush in 2001 after the 9/11 terror attacks took place. In September of 2017, Trump moved to eliminate DACA (Deferred Action for Childhood Arrivals), a move that put in jeopardy the immigration status of over 800,000 individuals who had come to the United States as children. His relationship with KIm Jong Un has also emphasized Trump’s lack of diplomatic skills and inability to handle delicate diplomatic situations with countries such as North Korea, and the list goes on. The fact of the matter is, however, that the Trump presidency will not be defined by any of these moves, which would have been enough to stain the tenure of any prior president in United States history. In the case of President Trump, he will be remembered as the president that Russia helped choose for the American people. The Russian interference in the 2016 election has been in the spotlight since the months leading up to Trump’s election in November of 2016, but the story surrounding their interference has unraveled and blossomed like a grotesque flower, unveiling a scandal the size of which hasn’t been seen since the Nixon era and Watergate. Trump has tried to decry the Russian probe investigation, spearheaded by Special Counsel Robert Mueller, as a “witch hunt.” Mueller’s record speaks for itself, however. The probe has embroiled individuals closely related to Trump’s campaign and presidency, such as Paul Manafort, Michael Cohen and George Papadopoulos, each of which played a role in either withholding information from the FBI regarding the Kremlin’s contact with the Trump campaign, or directly aided in the facilitation of this contact. The groundbreaking nature of the Mueller investigation has brought to light a level of corruption once thought to be unthinkable within the United States, which is often seen as a bastion of democracy and jurisprudence, at least in the eyes of the international community. This image has been shattered, revealing a faulty and vulnerable system that has polarized the country more than ever. While the effects of Trump’s election and the Mueller probe on the American political climate have been palpable, the effects of these events have had reverberations that reach far beyond U.S. borders. An emboldened Russia has taken steps to reassert itself as a dominant power on the international stage, and the Trump presidency has aided in its endeavour. 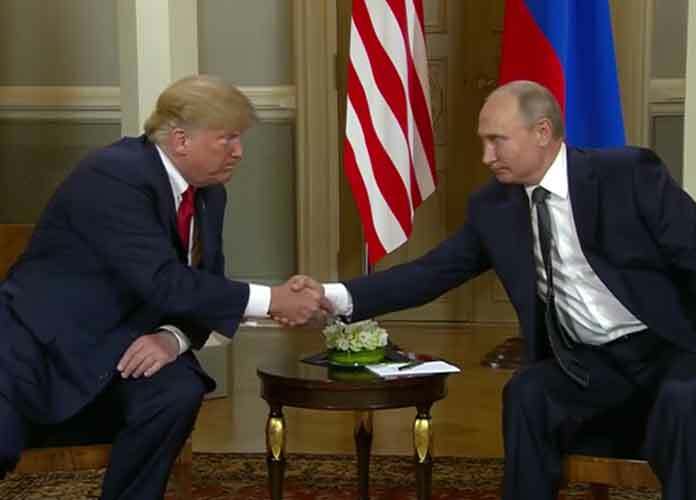 By destabilizing the United States and throwing the political climate into a maelstrom of hate and division, coupled with cultivating a warm and positive relationship with President Trump, Vladimir Putin has created the conditions necessary to rebuild Russia in his vision. In Trump, Putin has both a distraction and a buffer that, so far, has worked to keep the United States on the sidelines while the Russian President expands his power and influence in ways he was unable to while the likes of President Barack Obama or President George W. Bush were in office. While most of our attention has been turned to Trump and the controversial storylines that define his election and presidency, potentially one of the most important conflicts of the decade has gone uncovered by mainstream media. The Ukraine Crisis, a conflict that started back in 2013, threatens to put much of Central and Eastern Europe on red alert. The crisis has led to the annexation of Crimea by Russia, as well as a continued conflict in the Donbass region of Ukraine (namely the Donetsk and Luhansk regions), where a separatist movement led by the Donetsk People’s Republic (DNR) has put further pressure on the sovereignty of Ukraine. The DNR has been openly supported by the Kremlin on various occasions, a recent example of this being Russia’s adamant support toward aiding in the investigation surrounding the assassination of DPR Prime Minister Alexander Zakharachenko. Russia’s interest in this is clearly an attempt to aid a movement within Ukraine that supports their interests: a further destabilization of a country that was very close to joining the European Union, a move that would shrink the buffer between the West and Russian territories. A piece written by The Guardian in recent weeks shared the voices of nine foreign ministers that highlighted the world’s concern over a conflict that has fallen out of the limelight in recent years. And yet, their collective voices indicate that our attention should once again turn to Ukraine and its fight to regain territories arbitrarily usurped from their grasp by the Kremlin. The ministers have called for global condemnation of the annexation of Crimea, as the Kremlin’s actions have thrown international law under the bus. Numerous human rights violations have been perpetrated against the the native population of Crimean Tatars, including the dismantling of Tatar media outlets that would dare speak out against what it clearly an illegal occupation of Ukrainian territory. The human rights violations don’t stop at impeding freedom of expression, however. In a report released by Human Rights Watch in 2017, the organization highlighted some of the more gruesome atrocities taking place in the region at the hands of the Kremlin. The report lists, “physical attacks, unlawful searches of Tatar households, and enforced disappearances” of those who would speak out against the annexation as but a few of the horrors the natives of the Peninsula face on a daily basis. The Guardian piece also highlights that while the world has averted its gaze from the crisis, there have been increases in tension between Ukraine and Russia, especially surrounding the Sea of Azov. In November of last year, Russian ships blocked the passage of two Ukrainian gunships, both detaining them and 24 Ukrainian sailors in the process. While Russia claimed Ukraine was in some way “breaking a set of regulations” between the two countries, it is important to note that much of the conflict has revolved around control of Black Sea ports, which is one of the reasons for the Kremlin’s desire to annex Crimea in the first place. Any argument made by Russia in this vein is marred by this, mainly because they have so blatantly broken international law to secure these advantages. Russia’s attempts at re-establishing itself as a super power has not stopped simply with Ukraine, however. In February, Belarusian President Alexander Lukashenko indicated that Belarus is ready to merge with Russia. While the unification of Belarus and Russia would be based on the consent of both countries, the unification would give Russia yet another swath of territory. Territory that would border countries such as Poland, Lithuania, Latvia and would also reach Ukraine’s northern border, a move that would cause additional unrest in the region. Why Should Russia’s Actions In Central Europe Matter To The United States? It would be easy to disregard all of this and say that Russia’s actions in Europe are not of the concern of the United States. Trump’s presidency has been decidedly focused on putting the “America First.” In December 2018, Trump clearly stated that the U.S. would no longer be the “police of the world,” underlining his commitment to prioritizing the interests of Americans rather than those of other nations across the globe. This has been further underlined by Trump’s policy towards the United Nations. In a speech before the General Assembly in September, Trump emphasized his already well-known reservations towards the United Nations with statements highlighting the importance of sovereignty and independence from any restrictions the world governing body may impose. Of course, the purpose of the U.N. was never meant to be a platform for world government, but more as a forum for peaceful negotiations and diplomatic resolutions to worldly issues. Trump made clear in his speech that the U.N. has failed in this regard, citing issues related to both the U.N. Human Rights Council and rejecting the idea of the International Criminal Court entirely. This, coupled with multiple cuts to U.N. funding show that Trump is clearly inclined towards the idea of extricating the U.S. from any sort of agreement that gives him, or the nation, any duties that may not suit his agenda. And yet, Trump’s stance threatens to shatter the international order of the world as we know it. The problem with Trump’s stance isn’t that he supposedly wants to put America first. The problem comes down to reverberating effects of the U.S. taking a backseat in a world it has helped shape throughout history. The main effect that comes to mind is the threat that Russia would pose to NATO, if its consolidation with Belarus and if it’s efforts in Ukraine were to go unchecked. In the event that Russia were to annex both Belarus and Ukraine, Russia would add a substantial swath of former Soviet territory to its landmass, and its borders would extend across eastern Poland, Lithuania and Latvia, all of which are NATO members. Russia would also now directly border the country of Moldova, which has its own issues with Russia related to the disputed region of Transnistria, a sliver of land between Moldova and Ukraine still controlled by Russia since the Cold War. The unease surrounding the region is still very real, with Ukraine recently enforcing its border with the Russian- controlled landmass ahead of the upcoming presidential election. While much of this is, at least regarding the annexation of the entirety of Ukraine, is pure speculation, the stance Trump has taken towards Russia has given Putin the best chance he’s ever had to extend Russia’s dominion over its former satellite states. Trump’s stance towards NATO only adds further concern, with the president having suggested leaving NATO on multiple occasions, as per the Washington Times. The implications of such a decision would be devastating, which would leave the rest of NATO’s members to fend for themselves if one of the Baltic states were to become the Kremlin’s next target. It would also signal the U.S. turning its back on its allies, and certainly have a substantial impact on the foreign relations between current member states. Despite the U.S. largely not interfering with Russia’s actions, it has to be acknowledged that the government has not gone entirely quiet regarding Russia’s aggression towards Ukraine. In the past few days, the U.S. Department of the Treasury’s Office of Foreign Asset Controls (OFAC) added a substantial number of both Russian nationals and entities to OFAC’s Specially Designated Nationals List, including members of the Federal Security Service of the Russian Federation, and members of the Donetsk People’s Republic. The list itself in a compilation of individuals and companies that have their assets blocked in the United States. The list also prohibits any sort of dealings with these individuals and companies by U.S. entities. The problem is that while the U.S. has strengthened its sanctions against Russia in some areas, it has loosened them in others. For example, this past January, sanctions towards EuroSibEnergo, EN+ and Rusal were weakened by the Trump administration. These entities belong to Russian oligarch Oleg Deripaska, who allegedly played a role in Russia’s interference with the 2016 election. Imposing sanctions on one end, while lifting them on the other doesn’t inspire much confidence in Trump’s ability or willpower to stand up to Russia. Russia’s actions at home should also case some worry for the United States. The reason for this is that, while Russia strengthens its position abroad, Putin has also been cultivating a strong foundation at home that would carry his legacy past his time in power. One of the most interesting ways he and the Kremlin have done this is through the youth organization Nashi. The pro-Kremlin youth movement is seen as one of the pillars upon which “Putinism” will persist, well after Putin is no longer President. The surge in pro Kremlin youth support shows that there is indeed a base upon which Putin’s legacy can be imparted and carried on like a blazing torch for years to come, which is a worrying thought for a multitude of reasons. First, “Nashi” is an example of a government grooming a youth movement to support its values – which find their roots in heavily nationalistic rhetoric. These values have often found themselves in line with Russian philosopher Ivan Ilyin, a man whose views often supported fascism as Russia’s key to glory. By ensuring his political base and ideas are secured for the future, Putin extends the threat faced by Central and Eastern Europe, and by extension threatens the very foundations of political stability the U.S. has helped to create. Trump’s lackadaisical approach towards Russia underlines his blatant disregard for the danger his approach toward Putin signals. By no means do I suggest the U.S. should assume a strategy of hostility to Russia, but as a member of the international community, Trump has a responsibility to oppose threats that could have devastating effects on both the interests of the U.S. and its allies around the world. Institutions such as the United Nations and alliances such as NATO have helped create a peaceful world in the aftermath of the Cold War. While appeasing Putin may seem on the surface as a path towards peace, the unfortunate reality is that Trump is appeasing an insatiable force – a force that is driven by legacy and pride, a force that will never have a better chance to make a resurgence and grasp at its former glory, at the cost of sovereignty and the desolation of Democracy in places that fought so hard to attain it.